PATNA: The continuing deadlock in the Grand Alliance in Bihar over seats sharing appears reaching a happy end with the Congress under tremendous pressures to save the alliance so as to deflect prove wrong the opposition’s allegation that the grand old party is not adept in handling coalition politics. As per the agreed formula, the RJD will be contesting on 20 seats while the Congress will contest on nine, as per the media reports. Previously, the Congress was refusing to bring down its number of seats below 11. Similarly, the Rashtriya Lok Samata Party (RLSP) has been given four seats, Hindustani Awam Morcha three seats while two east seats have been offered to Sharad Yadav’s party and Vikassheel Insan Party (VIP), as per media reports. RLSP is headed by former union minister Upendra Kushwaha while HAM is led by former chief minister Jitan Ram Manjhi. Reports added most of the leaders have returned to Patna from Delhi and are expected to hold a joint Press conference tomorrow to give details to the seat share. However, this has not been officially confirmed. 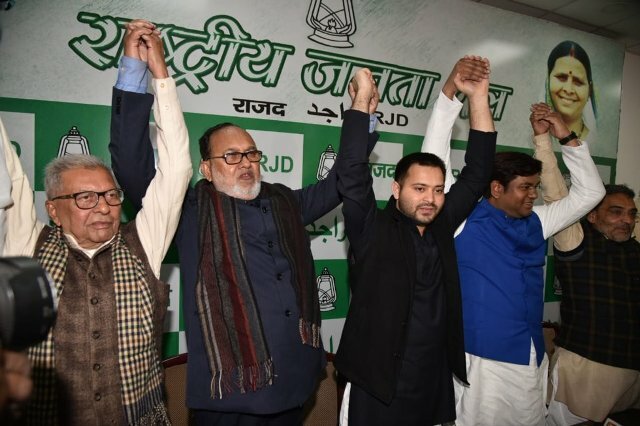 Sources in the RJD said the Congress party which won two out of 12 LS seats in Bihar in the last election had been rigid over number of seats while the RJD wants to bring down its number to accommodate other new entrants to the alliance. The Congress has been facing severe criticisms for failing to save coalition in crucial states like Uttar Pradesh and West Bengal. In Uttar Pradesh, the Congress had been rather slow in initiating the negotiation process and instead waited for the other allies to initiate the alliance talks which didn’t happen. Instead, the Bahujan Samaj Party (BSP) led by Mayawati and the Samajwadi Party headed by Akhilesh Singh Yadav sealed the deal between them while leaving two seats for the Congress. In a good gesture, the Congress party too left seven seats for the BSP, Samajwadi Party (SP) and RLD in Uttar Pradesh but Mayawati made it clear she won’t have any alliance with the former for the upcoming Lok Sabha election. “Congress is free to field its candidates in all 80 seats which means the alliance is able to defeat BJP on its own. Congress should not mislead people,” the former Uttar Pradesh Chief Minister said in a tweet. The Congress also failed to stitch an alliance with the Left parties despite prolonged negotiation while the Trinamool Congress chief Mamata Banerjee never showed an interest in joining hands with the Congress and announced candidates for all seats much before.